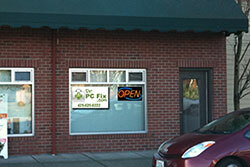 Dr PC Fix is your trusted source when you need help with your computer – fast! We offer a large range of services to help any customer with their computer problems. Custom PC Builds for high-end workstations and gaming systems. Have a question, dilemma, or on-going problem? We’re here to help. We can come to you to help with repairs, networking, data backup and more. Quick, reliable repairs on any machine: PC, Mac, Linux or Windows. Custom gaming and high-end workstations and systems. We help companies and home owners recover from a computer crash. We have the know-how to safely remove viruses and malware. Keep your computer and software up-to-date and running fast. Protect your files. We are a certified Carbonite partner. Connect your computers and accessories to the internet and each other. We can help you safely dispose of any computer or electronics. If we can’t solve the problem, you don’t pay a dime. Guaranteed!